← Add some spectacular Sparkle to your Webkinz room! The Be Merry Fawn arrives in Webkinz World, December 1, 2018! Start the holidays off right by adopting a Be Merry Fawn into your family of Webkinz pets! This happy holiday-themed pet has a love of antique toys, so they’ll really enjoy hopping on their Vintage Rocking Horse for a little fun! They also enjoy eating healthy snacks, so when they’ll getting a little hungry, feed them a Roasted Pear Salad! 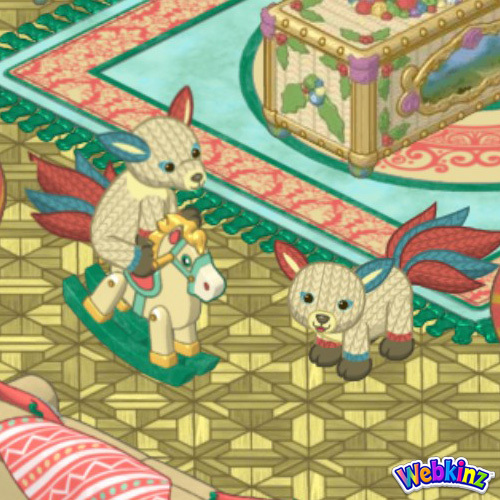 2 Responses to The Be Merry Fawn arrives in Webkinz World, December 1, 2018! These pets and the room theme are just beautiful. I got her and named her Mittens.